I’m so lucky to have been invited by Omni Hotels & Resorts to visit their absolutely stunning resort in Amelia Island, Florida. The Amelia Island Plantation has recently undergone an extensive renovation that has elevated it to one of the top destination wedding spots in the country. 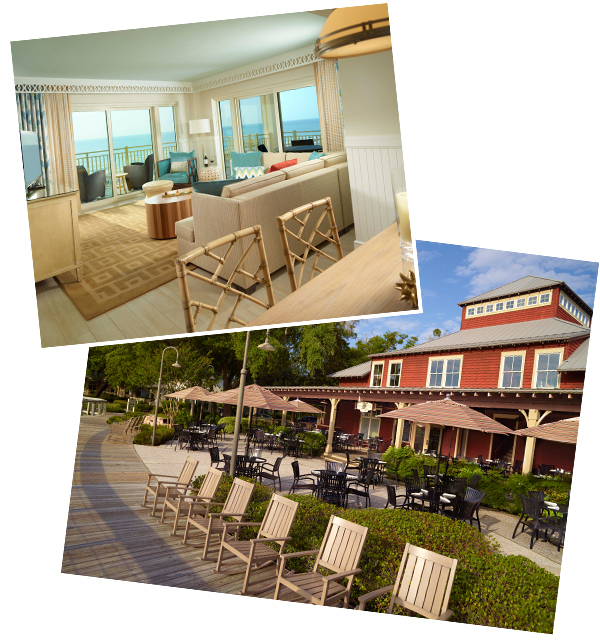 The gorgeous resort is nestled at the tip of a barrier island off the Northeast Florida coast, which makes it a very accessible, yet lovely, location for couples looking for a destination wedding location. Surrounded by sparkling water from the Atlantic and lush salt marshlands, the Amelia Island plantation has created a unique setting for you to consider for your destination wedding. I’m so excited to tell you a little more about my experience in Amelia Island along with the experience that Omni Hotels and Resorts have created for brides and grooms looking for a world-class destination wedding location. We were blown away by the new renovations as we settled in on our first day at the spectacular Omni Amelia Island Plantation. You enter the awe-inspiring lobby, and you’re immediately surrounded by incredible restaurants and lounges, which are perfect for spending time with friends and family before the wedding. If you’re looking for a little more privacy, you can choose from one of 330 spacious one, two, or three bedroom villas scattered throughout the resort. From the villas and the hotel, you have access to 3.5 miles of private beach to explore. After seeing more of the hotel and island, we went for a romantic dinner at Oceanside, a breathtaking restaurant on the resort grounds that overlooks the resorts’s multi-tiered pool, that is known for its delicious and original “Floribean” cuisine. We ate fresh oysters Rockefeller and filet mignon while overlooking the moonlit ocean, which was the perfect way to end our first day on the island. On our second day at the Omni Amelia Island Plantation, we explored the resort, much like your guests can do as they anticipate your big day. Having a destination wedding in Amelia Island will give your guests the opportunity to turn your wedding day into a beach vacation. The island doesn’t simply cater to brides and grooms, there are shops, tours, sports like golf and tennis, and so much more for your guests to enjoy in the days leading up to or following your wedding. We were happy to enjoy a little peace and quiet spent playing in the sun under one of the resort’s large beach cabanas. Our final day on the Plantation was spent learning more about and exploring the various venues that the resort can offer, but not before we enjoyed a morning at The Spa at Omni Amelia Island Plantation. I had an incredible Seaside Sensory massage at the spa with a vichy shower, which was a first for me. My treatment included a 3-step exfoliation under the restorative waters of the vichy shower using rich plant sterols, arctic white peat and a wild cherry blossom rice buff, and a 25 minute massage and cool down treatment. The spa is the perfect place for you to relax before your wedding or on the honeymoon after the chaos is over! After our beautiful morning at the spa, we explored the site’s various venue spots. You can have a casual wedding ceremony beachfront with the Atlantic Ocean as your backdrop, or on the Ocean View Terrace overlooking miles of gorgeous white sand beaches. Or if you’re looking for something more formal, you can have your ceremony performed at the Amelia Plantation Chapel or Oak Point Lawn between Spanish moss-covered oaks. Your options get even larger when it comes to choosing a reception venue, with 10 absolutely breathtaking venue locations. I fell in love with the Marsh View restaurant, which overlooks the historic and scenic marshlands that make this part of Florida so beautiful. Walker’s Landing also offers a view of the wild, yet wonderful, salt marsh. According to your style, you can choose a reception location for a small wedding of around 50 people to larger parties of 350 plus. 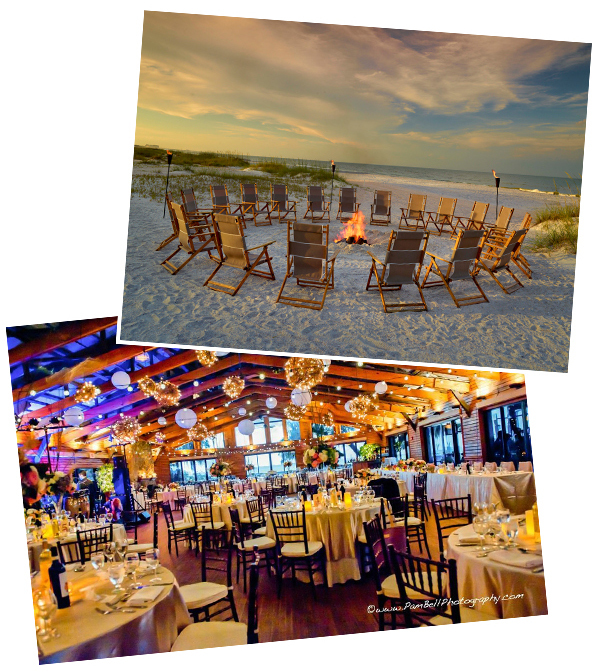 The possibilities really are endless in Amelia Island when it comes to what type of destination wedding you’re planning. If you plan your wedding at the Omni Amelia Island Plantation, you will also be treated to special amenities that they reserve for coupes getting married. The Omni provides you with wedding night accommodations, and when you choose from one of their various wedding packages, you also get your venue, linens, chairs, dance floor and more included. Just a few less things you’ll have to worry about as you work with their on site coordinators and catering professionals. Having the Omni Amelia Island Plantation plan your wedding for you will free you up to enjoy your destination wedding and time with family and friends. Our favorite perk of having a destination wedding is that you can immediately start your honeymoon as soon as the wedding is over! Amelia Island not only makes a great wedding destination, but it also makes for a fantastic honeymoon location! If you’re looking to relax with a few games of golf or tennis, you’ll be hard pressed to find a better resort. You can also relax in the salon and spa where they offer full body massages, facials, and manicures and pedicures. But what if you’re a more adventurous couple? Well, the island is a fantastic place to honeymoon if you’re looking for adventure, as they offer a number of excursions and experiences to quench your thirst for adventure. You can kayak through the vast salt marsh, paddleboard on the serene island waters, or horseback ride over miles of beach. The resort also offers renowned fresh and saltwater fishing, either by catering an offshore tour or dockside angling. Thanks again to the Omni Amelia Island Plantation for your hospitality, we’ll be back for sure! Please visit Omni Amelia Island Plantation Resort’s website to learn more about this absolutely stunning destination wedding location. Featured	Learn Floral Design from Sarah Winward. Sale Ends Tomorrow. Featured	We Love Our Vendors! Every bit of this wedding is infused with just enough modern glamour to create the perfect ambiance.